Kalijira rice from Bangladesh is considered to be the finest tiny aromatic rice in the world. It is shown here in a pilaf. Photograph courtesy Lotus Foods. This is Page 4 of a six-page article and glossary. Click on the black links below to visit other pages. There are two primary types of rice: the indica and japonica varieties. Indica rice varieties grow well near the equator. The kernel is four to five times longer than it is wide. 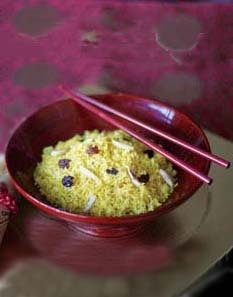 When cooked, the rice is fluffy, with separate kernels. 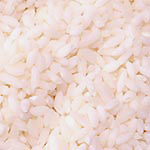 Basmati and jasmine are two well-known indica rices. See grain types and japonica rice. Instant rice is white rice that has been parboiled (precooked) and dehydrated to enable a faster cooking time. It is cooked by adding one cup of boiling water to one cup of rice; then stirred, covered and allowed to stand for one minute to reconstitute. It is more expensive due to the convenience, but less flavorful than regular rice. This is not an official kind of rice. Consumers requesting “Japanese rice” are generally asking for short-grained rice for sushi. See also koshihikari rice. Grown in Thailand, jasmine is an aromatic long grain rice that has a distinctive jasmine aroma after cooking and a faint flavor similar to that of popcorn. The cooked grains are soft, moist and cling together. Jasmine is the most popular rice in Thailand and Southeast Asia. This excellent white rice cooks in similar fashion to basmati but possesses a rounder, more starchy grain (i.e., it’s sticky, where basmati is not). It can be interchanged with white basmati rice in recipes. It naturally lends itself to coconut dishes and seafood dishes. Jasmine rice is a good source of B vitamins and complex carbohydrates. See photo in the chart on the previous page. Japonica rice is one of the two primary types of rice, the other being indica. It grows throughout the world in temperate and mountainous reasons. It is the moist, sticky, bright white rice used in sushi—medium-grain rices are moister and more glutinous (sticky) than long-grain rices, and they are ideal for Mediterranean and Asian dishes that require stickiness, like risotto, paella and sushi. The kernel is two to three times longer than it is wide. There are different types japonica rice including Calrose, developed at the Rice Experiment Station at U.C. Davis, which oversees the development of new and improved japonica varieties. The two japonica varieties favored by the Japanese are akita komachi and koshihikari, also grown in California. The “prince of rice” is considered the best tiny aromatic rice in the world. Grown in Bangladesh, this tiny, non-glutinous (not sticky) rice cooks in only 10 minutes (just like basmati rice) producing a delicate aroma, taste and texture. It can be enjoyed as an everyday plain rice or as an alternative to basmati, especially in a pilaf. It is traditionally seasoned with whole aromatic spices such as cinnamon sticks, cloves and cardamom pods. Add some nuts, dried fruits, vegetables and beans (or meats) to the rice and turn it into a main meal. Kalijira is also available in a brown rice variety through Lotus Foods and other purveyors. Also see the photo at the top of the page. Photo courtesy of Lotus Foods. A short-grained japonica rice, considered by many to be the finest short-grain rice in Japan. It is also grown in California and elsewhere. A red parboiled rice from Kerala, India. Also called rose matta rice.